Just yesterday I had written a article about Nokia Asha 210 being available in India for pre-order for Rs.4499.00 and my only grouse with it was that it did not support 3G network. It seems the Nokia guys read my post and today launched the 3G enabled Nokia 301. 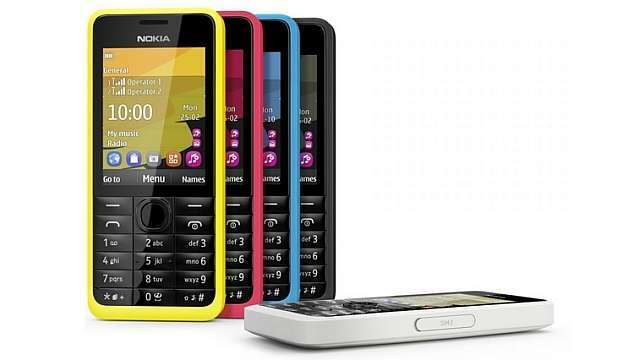 Unlike Asha 210 which has QWERTY keypad, the Nokia 301 comes in a candybar standard design. It has a 2.4 inch 240 x 320 pixels (~167 ppi pixel density) TFT display supporting 256K colours. It comes with single and dual SIM capabilities, the dual SIM one is listed on Yebhi.com at Rs.5099.00. The Nokia 301 runs on the no frills S40 platform. It has a 3.2MP "smart camera" which gives you all kinds of editing and sharing options. The 301 also lets you take your own picture with the rear camera with voice command. Its 5-in-1 camera app lets you choose and apply one one of five camera effects to their images. Alas it doesn't have a front camera so video calling will be pretty difficult. The dual SIM model has a EasySwap feature which allows you to switch the SIM cards without turning the phone off. The phone has a internal memory of 256MB which I think is pretty less in this day and age of GBs. The phone will run on 64MB RAM which is pretty good. The phone supports external memory via MicroSD card slot for upto 32GB. The external dimensions of the phone are 4.49 x 1.97 x 0.49 inches and the weight	is 102 g (3.60 oz), quite neat for a budget phone. The phone is powered by a 1110 mAh battery (BL-4U) with stand by time of upto up to 888 hours on 2G and upto 936 hours on 3G (surprise). It gives a talktime of 20 hours on 2G network while talking on 3G network can last upto 6 hours. Connectivity wise it has EDGE, 3G and bluetooth support with a strong impetus on social networking. Nokia 301 allows you to stream YouTube videos and Facebook, Twitter and WhatsApp quite easily. It also has a lite version of Mail for Exchange will allow users to check mails and sync calendars too. My only surprise is the price for colours. Yebhi.com as mentioned above list the Nokia 301 Blue at Rs.5099.00 with EMI facility and 4 to 7 days delivery. While another portal Flipkart posts the price as Rs.5590.00 for Black and Cyan models. You can visit the Flipkart page here, it gives cash on delivery and EMI options and delivery within 7 to 9 days.